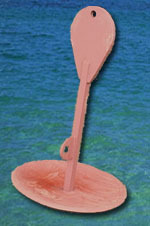 Anne’s mushroom anchors are a superior alternative to imported, cast-iron mushroom anchors. 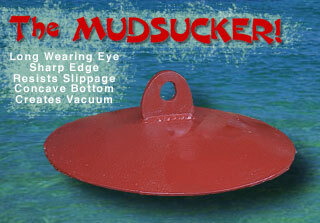 Our mushroom anchors are manufactured from 70,000 psi. tensile strength steel vs. 16,000 psi for cast-iron mushrooms. Our anchors provide you with a larger bell diameter, a more aggressive biting edge, and a counterweight to hold the anchor at the right attitude. The absence of a counterweight in the cast-iron mushroom allows the anchor’s attitude to change to a vertical position. When the anchor is in the vertical position, the anchor chain can become wrapped around the shaft. This can cause the anchor to lose it’s holding power. The use of similar metals in the design of our anchors has eliminated the problem of cathodic corrosion; that has often been the failure in the cast-iron mushroom. Also, by welding on both sides of the bell and counterweight, the joint formed has the same tensile strength as the base material (70,000 psi). Vacuum Created Under The MUDSUCKER Approaches The Holding Power Of Anne’s All Steel Mushroom! Website Development by Todd Media, Inc.